Are you a homeowner who experienced steaming at your local gym or resort and now would love to install a steam shower at home? Maybe you feel hesitant about the potential cost of creating your own in-home spa, concerned about the amount you’d need to spend to install this amenity. What you may not be factoring in to this equation are the savings that a home spa can provide. Installation may cost less than you think, while the potential health benefits and increase in your home’s resale value are big considerations as well. Let’s explore what an in-home spa will cost you over time. Steam shower costs can be broken down into an initial, upfront installation budget, the cost of maintaining the equipment, and the energy expended. The size of the shower stall. The larger the area, the more powerful a steam generator is required – as well as the cost of additional materials to construct it. The type of material you choose. This ultimately depends on your personal aesthetic, but you do have to consider certain physical properties, addressing these by selecting the right-sized generator. The more porous a material, such as marble, shale, granite, glass block, or concrete, the more quickly it dissipates heat. If you choose marble or stone for your steam shower, you’ll need to select a more powerful generator to compensate for the more rapid heat loss. But if you choose nonporous materials like ceramic, porcelain or acrylic, you will retain heat in the shower, and a smaller generator will be adequate. The sophistication of the controls chosen – which range from simpler models to ones that include personalization and other enhanced options. The blog post Which MrSteam SteamShower Control Is Right for You? allows you to explore the differences and choose the right level of control for your personal needs. Additional therapies, such as AromaTherapy, MusicTherapy, and ChromaTherapy, as well as such add-ons as in-shower seats, in-shower lighting, towel warmers, and more. In addition, professional construction costs vary based on the area in the country in which you live. See “Here Are the Best and Worst States to Build Your Home, Study Finds” to get a sense of the range of home building costs, which you can extrapolate into your bathroom new construction or renovation project. Let’s talk numbers by comparing these MrSteam projects. Note that these figures are based on mid-range to high-end finishes, tile, and flooring. 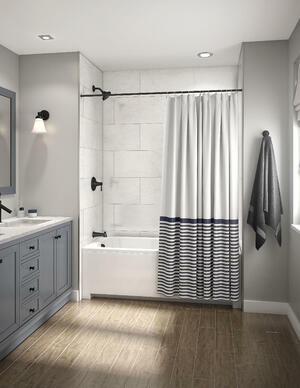 This next project takes a room with a standard tub and shower to a tub with a steam shower. The total dimensions are 5’6” wide x 3’ deep x 8’ high. In other words, for a mere 25% investment, you can have an in-home spa installed that gives you and your family hours of health and wellness. Of course, once your steam shower is installed, you should factor in what it will cost to maintain. It’s reassuring to know that all MrSteam generators, controls, and accessories come with a limited lifetime warranty, allowing for free service for two years after purchase. Generators also include free parts for a lifetime. Do make sure to register for your warranty and check the individual agreements for the specific conditions under which your warranty applies. These three steps will minimize the need to call in a professional to maintain your system. You may be surprised to learn that energy usage for a MrSteam steam shower is typically less than $1 for an average steam shower session. To produce the steam needed for a typical 20-minute steam bathing session, a home steam generator only needs to heat two gallons of water—much less water than you use in a bath or shower! A week’s worth of steam sessions uses only 14 gallons of water. This makes a steam shower more of a savings than an expense! Relieves stress and promotes deep, restful sleep. Both can have long-term effects on your physical and mental health. Relieves congestion, allergy symptoms, and arthritis, which may save on pharmaceutical and medical expenses. Cleanses the skin, reducing the need for cosmetic and dermatological treatments. Enhances athletic performance and burns calories, which can help you attain and maintain physical well-being. A full list of the benefits of steam bathing can be found at the 40+ Benefits of Steam. While these benefits may not translate directly into dollar savings, they not only enhance your well-being, but may save on healthcare and other expenses over time. One more consideration in making the decision to invest in a home spa is the net gain when you come to sell your home. According to Zillow, installing a steam shower in the home could earn you a 29% higher sale price than listings without it. Clearly, a home steam shower is an affordable option that costs less than you’d expect – and saves you in energy costs, long-term health, and as an overall lifestyle change that enhances the well-being of both you and your family. This is one investment that you’ll be glad you made every day that you use your home spa!